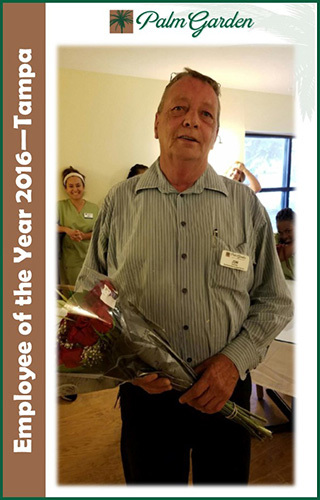 Palm Garden of Tampa’s Employee of the year is Jon Irvine – our Environmental Services Supervisor and resident IT Guru. Jon has been active in the health care industry since 2005 and joined the Palm Garden of Tampa team in the summer of 2011. His specialized training in diesel mechanics, air conditioning and carpentry, as well as his various licenses, made him an immediate and valuable member of our team. Beyond his technical expertise, Jon brings an enormous level of empathy to the facility. A people person, Jon is always interested in the new residents, their interests, and special needs. Long before the “Palm Garden Way” became a corporate ideal, Jon was going the extra mile. And the residents he has touched with his personal intervention are a testimony to that. It is not unusual for Jon to bring in a specific book or DVD that will catch the interest of a particular resident. He constantly provides the little extras that make the difference between a room and a home. Many times, at our good-bye ceremonies, it is Jon who is remembered most fondly by departing guests. If a computer is down, or a printer malfunctions, it is almost always Jon who gets a frantic call. And he solves the problem…calmly, with a sense of decorum and deliberation. A last minute room change, a new unreported admission…all is handled with a simple respect and in a deliberate, competent fashion. No fuss, no muss. His subordinates are treated in a respectful fashion and he has been outstanding in forming a team the facility can rely upon. He even worked a laundry shift so that one of our team could attend the annual Christmas party. As his supervisor, I have been the most impressed with Jon’s work in the last year. As you all know, this has been a hectic and challenging time – managing a multi-million dollar construction project while maintaining a safe and happy environment for our residents. Through it all, Jon has been steady and stalwart. When relocating 8 offices into our temporary trailer, Jon stayed until midnight to ensure the computers were hooked up and operational the next morning. Now that is commitment!!! With his help and the hard work of Frank, Ben, the Social Services team and our nursing staff, we have been able to handle major relocations, room remodeling and service changes with little disruption to the smooth functioning of our facility. If possible, I would give an “Employee of the Year” award to every single member of our team – it has been that kind of year. But if I had to single out an individual to receive such recognition it is without hesitation that I nominate Jon Irvine. Jon – thank you from the bottom of my heart for your loyalty, hard work, and commitment. We are a better facility because of your commitment and dedication to our mission and our values.